In addition to original research and data analysis on important themes in the origins debate, ICR scientists also evaluate the progress of secular research reported in many scientific publications. One of the fruits of this research was noted in last month’s Acts & Facts Impact article on the topic of abiogenesis—the supposed development of life from non-life.1 It reviewed the history of research on the origin of life and showed how utterly futile the evolutionary explanations of the alleged naturalistic beginnings of life really are. The article wasn’t able to include all the important recent scientific publications on the topic, so we’ll cover some of those here. In the quest to find a water alternative, the emerging candidate is a clear liquid called formamide that is composed of hydrogen, oxygen, carbon, and nitrogen.2,3 Formamide promotes polymer bond formation more than water and can even react with other compounds under human-engineered laboratory conditions to form nucleobases and amino acids. However, there are several major problems with this idea. First, formamide is toxic—it’s not conducive to cell life. Humans manufacture formamide and widely use it as a solvent to develop pharmaceuticals, pesticides, resins, and plasticizers. Another big problem is that formamide does not occur naturally in any significant amounts anywhere on Earth. Therefore, it has been proposed that somehow radioactive minerals irradiated hydrogen cyanide and acetonitrile with gamma rays in select pockets on the early earth.2,3 But adding this speculation to the mystical laundry list of requirements needed for the evolutionary development of life still effectively brings the possibility of life arising from non-life to zilch. Adding this speculation to the mystical laundry list of requirements needed for the evolutionary development of life still effectively brings the possibility of life arising from non-life to zilch. Lasers and Asteroids to the Rescue? Another major impediment to life’s naturalistic origin is the atmospheric problem discussed in last month’s article.1 Earth’s current atmosphere is oxidizing (i.e., oxygen rich) and prohibits the spontaneous formation of biomolecules outside the protection of a living cell. Geological data indicate Earth’s atmosphere has always been oxidizing. 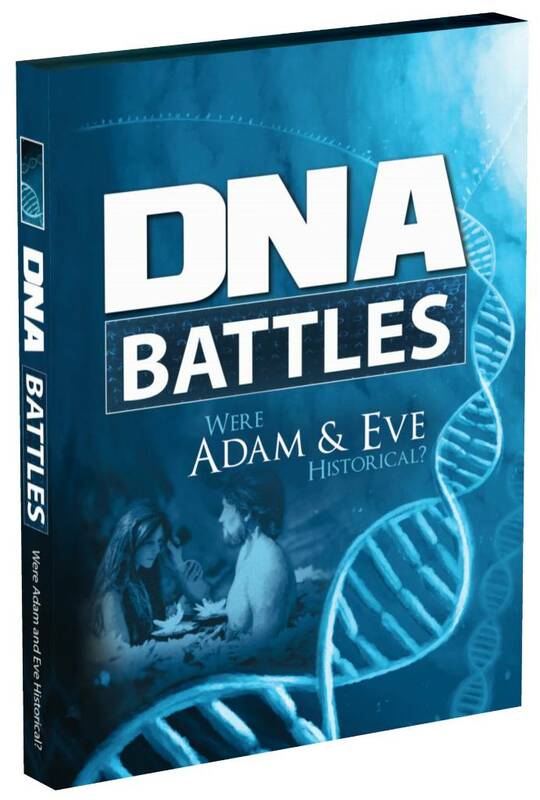 Nevertheless, evolutionists maintain that for biomolecules to spontaneously form, Earth must have had a reducing atmosphere with little or no oxygen. Even assuming it did, the problem of how nucleobases, the building blocks of DNA and RNA, could have spontaneously formed is still impossible. Recently reported research attempted to explain the spontaneous generation of nucleobases in a reducing atmosphere by using huge modern terawatt lasers. The idea was that the lasers would somehow simulate the plasma generated from an asteroid impact. When they blasted mixtures of ammonia and carbon monoxide, researchers found that trace amounts of nucleobases could be produced. However, as the authors’ report noted, “We observed hydrogen cyanide as a main product of formamide thermal decomposition.”4 The lasers induced the formation of formamide (discussed above), which was then broken down into hydrogen cyanide, an extremely poisonous liquid that boils at slightly above room temperature at 26 °C (79 °F). Hardly the essence of life’s beginnings! Tomkins, J. P. 2018. The Impossibility of Life’s Evolutionary Beginnings. Acts & Facts. (47) 3: 11-14. Zyga, L. Did water-based life originate without water? Phys.org. Posted on phys.org January 30, 2018, accessed January 31, 2018. Adam, Z. R. et al. 2018. Estimating the capacity for production of formamide by radioactive minerals on the prebiotic Earth. Scientific Reports. 8: 265. Ferus, M. et al. 2017. Formation of nucleobases in a Miller–Urey reducing atmosphere. Proceedings of the National Academy of Sciences. 114 (17): 4306-4311. 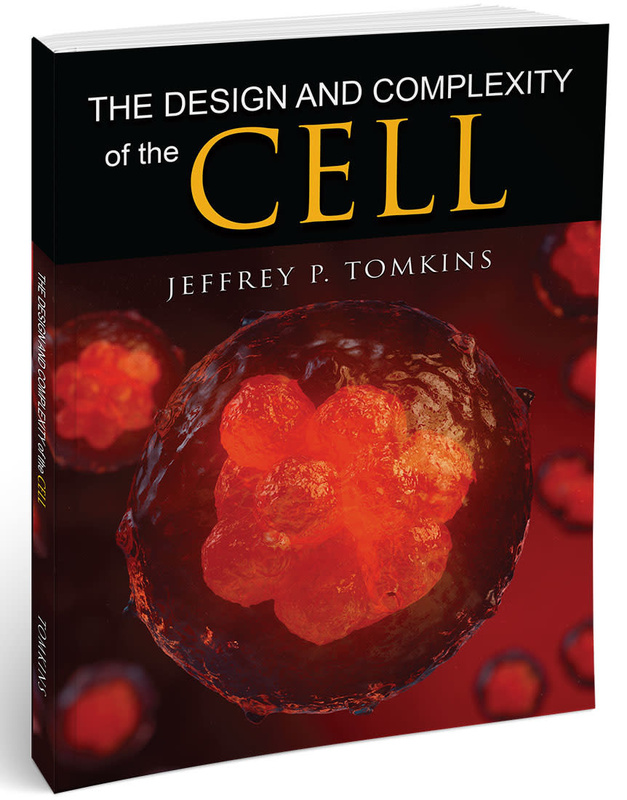 * Dr. Jeffrey Tomkins is Director of Life Sciences at the Institute for Creation Research and earned his Ph.D. in genetics from Clemson University. Cite this article: Jeffrey P. Tomkins, Ph.D. 2018. 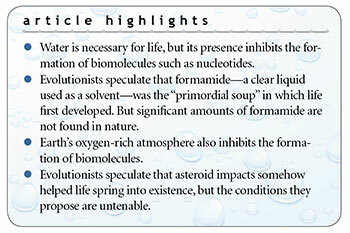 Abiogenesis: Water and Oxygen Problems. Acts & Facts. 47 (4).